Twitter reported its first quarterly profit on Thursday. Shares spiked more than 20%. 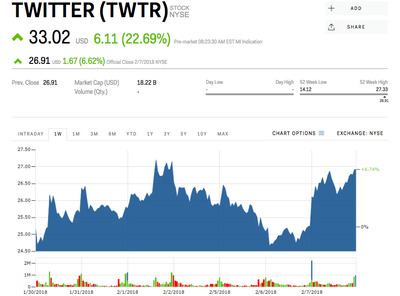 Shares of Twitter are soaring, up more than 20% in early trading Wednesday, after the social media company reported better than expected fourth-quarter results which included its first quarterly profit. Twitter reported revenue of $US731.6 million – 6.6% above the $US686.4 million that Wall Street had expected. On a per-share basis, the company earned an adjusted $US0.12; missing the $US0.14 that Wall Street was anticipating. While quarterly revenue rose just 2% year-over-year, Twitter managed to cut costs by 28%, resulting in the company’s first profitable quarter – a goal CEO Jack Dorsey laid out on an earnings call in February 2017.